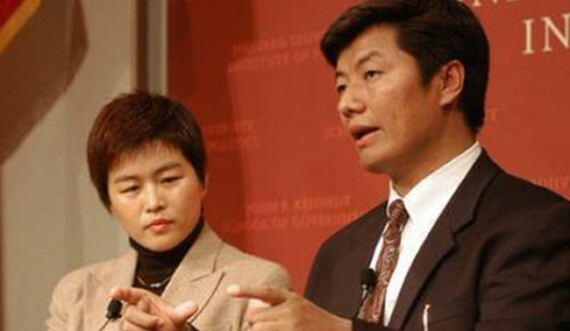 Lobsang Sangay, head of the Tibetan Government in Exile, discussing Tibet with Xiaojiang Hu, head of the Harvard’s Overseas Chinese Students Association, at a panel hosted by Radio Free Asia in November 2003. March 31st marks the 54th anniversary of the day His Holiness Dalai Lama was delivered to Indian custody by Tibetan freedom fighters, through a perilous mountain pass in Arunachal Pradesh with the Chinese Army in rapacious pursuit. And throughout the Tibetan diaspora, there is much deliberation about the state of Tibet’s freedom struggle. As the people in Tibet enact a singularly urgent form of protest — self-immolation — to challenge Chinese atrocities, those in exile feel despair and confusion about the refusal of the international community, Western powers in particular, to hold China accountable for the escalating crisis in Tibet. In the name of “stability”, Western powers are committed to policies that support the longevity of the Chinese Communist Party, puzzling indeed when considering the billions of Cold War dollars spent to defeat the same totalitarian ideology in the Soviet Union. Thanks to another Cold War relic, the Kissinger Doctrine, the People’s Republic of China has been legitimised and integrated into the world economy, Stalinist methodologies intact. China has a seat on the UN Security Council, while democratic India is denied such power and representation. China pays no reputational or economic price for its obscene record of genocide and destruction in Tibet, heads of state routinely snub the Dalai Lama, more Tibetans set alight their bodies, and the world looks away in uncomfortable silence. There appears to be a collective global amnesia about Communist China’s crimes against humanity, past and present. Mao Zedong killed at least 60 million people — some studies put the number at 80 million. Mao’s police state routinely tortures and murders its subject peoples for the crime of “counterrevolutionary thought”. The students of Tiananmen were punished for seeking democracy, Tibetans for practising the Buddhist faith. No one would think of walking into a party in New York or New Delhi wearing a Hitler T-shirt, but it is chic to sport an image of Mao Zedong, one of history’s greatest brutes. Why? Apologists for the Chinese Communist Party are ubiquitous, especially among Western academics who have a ludicrous nostalgia for Marxist thought — having never lived in a Marxist state makes it easier — and businessmen who profit off the cheap labour provided by Beijing’s party bosses. Apologists proffer the party line that China must never “lose face”, that China isn’t ready for democracy, pledging allegiance to the Communist Party, not the Chinese people and their aspirations for a rule of law, and willfully ignoring the plight of Chinese dissidents like 2010 Nobel Peace Prize laureate Liu Xiaobo, who languishes in prison for his brave and eloquent writings on democracy and justice. The gruesome images of self-immolations in Tibet — 110 at last count — and China’s ever more strident attacks on the Dalai Lama, add to unease about China’s aggressive stance with Japan and Vietnam, and reports of the extent of Chinese cyber espionage worldwide. The China apologists are on the ropes, and the Tibetan exiles have an opportunity to make their case that Tibet is a sovereign nation colonised by Communist China, which creates enormous ecological and security risks for all of South and Southeast Asia. But the powers that be in Dharamshala seem unwilling to seize the moment. Mr Sangay actually believe that China will engage in any kind of dialogue with himself or the Dalai Lama, whom the Chinese foreign ministry calls “an incestuous murderer”? Is he just saying so to pacify his audience or to appease Beijing, with the dim hope that this might bring them to the negotiating table? Those who have observed Mr Sangay’s rise know that he has spent years cultivating Chinese contacts and partners and is a well-known China apologist. Born and raised in India, Mr Sangay studied in Tibetan schools funded and managed by the Indian government. He obtained a scholarship to Harvard Law School, where he created a China-Tibet friendship society with Hu Xiaojiang, head of the Harvard’s Overseas Chinese Students Association, an influential branch of the Politburo’s United Front. Mr Sangay admitted that in 2005 he visited Beijing and Shanghai on an “Overseas Chinese National” document. The clip can be seen on YouTube. On August 16, 2012, Mr Sangay arranged for two Chinese Communist officials, Xiao Wunan and Gong Tingyu, to make a clandestine visit to Dharamshala, where they met with the Dalai Lama and the Karmapa, purportedly to discuss China’s development plans for Lumbini, birthplace of the Buddha. When the details of this visit were made public, months later, many Tibet supporters were wondering if Mr Sangay had cleared this with anyone with South Block. With China taking an increasingly bellicose tone with India, Mr Sangay’s alliances with Chinese officials should be examined in the context of India’s security. As designated leader of the Tibetan exiles, Mr Sangay should consider well how much the Tibet struggle owes to India. For 54 years, India has given shelter and protection to Tibetan refugees and the Dalai Lama. India has never fallen into the communist apologist camp, and thanks to India, Tibet has not been entirely forgotten or abandoned. Shocking. From whatever angle you read it. There is nothing wrong in making direct contact with the Chinese government officials, scholars and students. This is what the Dalai Lama encourages everyone to do, and this is how Tibetans can resolve this issue. Like PM Sangay, the Dalai Lama does so and so does the Indian government and the whole world, including US. Being PM, it is his responsibility to approach to the Chinese government and people to find a common ground where Tibetans and Chinese can make peace. I don’t see any big deal about it, Maura. I enjoy reading your articles on subjects relating to Tibet and Tibetans in diaspora. You’re able to write fluently and unfettered unlike many of my brethren who are hesitant in blowing the whistle. I guess your gift in writing is genetically inherited from your late pala Senator Daniel Patrick Moynihan who is one of my favorites serving the US government. While there are some interesting informations, and I must say there are a few that I’m a little befuddled with. Yes, I agree thanks to India, Tibet has not been forgotten. And, all Tibetans know that and the person who often profusely expresses his gratitude to the government of India and the Indian people is no other than our Sikyong Dr. Lobsang Sangay. He was born in India, raised in India and educated in India with help from India. He often states we can’t thank India enough for all its unstinting help. I also don’t see him as an apologist for China but rather a deft diplomat trying hard to negotiate in the labyrinth of geopolitical and international political maneuvers, etc. against many odds; indeed, an uphill battle. I must say I’m pleasantly surprised as to how well he is conducting under very arduous circumstances. I did not vote for him but I must admit he has clearly surpassed my expectation. I’m not surprised that he had travelled to China with Chinese travel documents. So did Lhautara Thupten Tendar and Kheme Sonam Wangdu who,too, had done the same when they visited China in connection with the signing of the infamous 17-Point Agreement in May 23rd 1951. As you might know the two travelled by sea from calcutta to Hong Kong and thence to Peking to join the other three: Ngaphod (Ngapo) Ngawang Jigme, Khechung Thupten Legmon and Sampho Tenzin Dorje who travelled by land through Chamdo. I had travelled to Tibet and China two times in 1994 and 2005 with the luxury of an efficacious US passport. With the Indian stateless certificate what choice does one have? Many Tibetans have done the same. We also hope for a dialogue with ever changing China. What other options do we have in diaspora when the global governments are callously oblivious to our cries for help, with our brethren now numbering 114 self-immolators. Some have quipped that we don’t get help because we don’t have oil which I totally disagree. We have more than oil. It’s called WATER. According to scientists next global war will be fought on water not oil. In addition, Tibet also has rich rare earth minerals, and a little of which can only be found in the vicinity of Lake Titicaca of Peru. Dialogue is possible despite China’s litany of anachronistic epithets against the Dalai Lama. The key is support from the Chinese people’s support. In the late ’50s during the height of the Great Leap forward movement, China blasted the US aggression about this and that. I, as a student, did my part in killing birds and insects and rummaged for any form of metal for the state. I still remember and can sing songs that I had learned during that period: Let’s destroy US imperial forces and Chiang Kai Shek’s army, etc. About a decade later chairman Mao was welcoming Richard Nixon and his entourage. So, things do happen in strange ways in the karmic cycle of political life and impermanence. I also find it difficult to agree with your statement that India has never fallen into the communist apologist camp. More than falling into the apologist camp, India has fallen into the communist bed when it signed the Panchsheel treaty with China in 1954 in the spirit of Hindi Chini Bhai Bhai. When gallivanting the Great Wall of China with my wife in 2005, I met a young couple from Kolkata: An Indian man and his Chinese wife visiting China. I asked him,”Kya huwa? Phir Hindi Chini bhai bhai ho gaya? He was hilarious and quipped,”Politics mai kuch kuch hota hana? The other thing our CTA will seize the opportunity when it presents itself, I believe. As human beings most Tibetans desire the Middle Way Approach or freedom. Frankly speaking, I sometimes feel very sorry for the peoples of various sovereign states who are fighting relentlessly and going for each other’s jugular. I even feel very sorry for many American families as a result of losing many of their sons in battles, and tremendous burden on the military personnels who suffer from depression and all sorts of mental illnesses due to war’s residual effects, etc. Whereas, we in diaspora are very fortunate, and at times I even feel guilty about it. But, that’s life. I see that many people try to minimize what Mrs. Moynihan wrote in her article. Someone says that: “there is nothing wrong in making direct contacts with the Chinese government officials”. Others see in it a “hope for a dialogue with ever changing China”. An Indian friend of mine wrote to me from Delhi: ” Gandhiji had always contacts with the British regime during the Indian freedom struggle and finally that contact helped to convince the British regime to go back”. Let’s not be so superficial. There is something particularly disturbing in what Mrs. Moynihan writes. That is: “On August 16, 2012, Mr Sangay arranged for two Chinese Communist officials, Xiao Wunan and Gong Tingyu, to make a clandestine visit to Dharamsala, where they met with the Dalai Lama and the Karmapa, purportedly to discuss China’s development plans for Lumbini, birthplace of the Buddha.” Eweryone knows that, with the assasination in Kathmandu of king Birendra and other nine members of the royal family and with the victory of Puspa Kamal Dahal, alias Prachanda, in Nepal the “last Hindu kingdom” has collapsed and the country has entered now in the orbit of the People’s Republic of China. In geographical terms, it is a dramatic change for India that sees, on another front, the Chinese on its doorstep. Everyone also knows that, with the entrance of Nepal in the Chinese orbit, for the 20,000 Tibetan refugees living in that coutry, the living conditions have become quite dramatic. A few days ago even the former President of the United States, Jimmy Carter denounced it. Having brought two officers of the Chinese Communist Party to Dharamsala to discuss with the Dalai Lama and the Karmapa the massive investments that China intends to do in the “Sacred Garden” of Lumbini and for the realization of the old project of Kenzo Tange for years still for lack of funds, means giving a “religious” endorsment to the “de facto” occupation of Nepal by the People’s Republic of China. Not only that. It is thought enough what it means to put in Chinese hands the first step (Lumbini) of that “Buddhist pilgrimage” (which includes Bodh Gaya, Sarnath and Kushinagar) that the Buddha himself encouraged in the Mahaparinibbana Sutta? In the event of future political crisis (for example for the Senkaku Ilands) will come the day when, again for example, Chinese will prohibit Japanese pilgrims to visit the place where the Buddha was born? It has been estimated enough the political use that China could do in the future of a Lumbini that has become its private property? With the “clandestine” visit to Dharamsala of Xiao Wunan and Gong Tingyu we are probably facing an unconscious case of “intelligence with the enemy”. And that “unconscious” makes it doubly serious. I was really please to read your past articles. As common reader I found this article seems going in rudderless and seems barking at wrong trees. Looking forward to see your wisdom in this site.